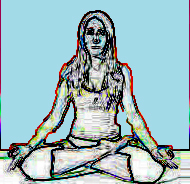 Padmasana (Full Lotus Posture) is a cross-legged sitting posture, in this posture the feet are placed on the opposing thighs. It is an established posture, commonly used for meditation and the position is said to resemble a lotus. This posture is adopted to encourage proper breathing for associated meditative practice and to foster physical stability. Sit on the floor with your head and spine erect without sagging your shoulders. Keep your legs straight in front. Bend your right knee and bring the lower leg up into a cradle. Bend the right knee and bring the right ankle to the left hip crease with the sole of the right foot facing upwards. Settle the foot into the hip crease. Bend the left knee and cross the left ankle over to the right hip crease with the sole of the left foot facing upwards. Repeat, with the left foot on the bottom and the right foot on top. Allow the body to remain steady for long periods. The posture applies pressure to the lower spine, which may facilitate relaxation and burst stress. Decrease in muscular tension and blood pressure. Warning: If you feel uncomfortable or your body is not designed for this pose, do not force it. This may cause problems for you, carry out practice with any other pose.